1997; Alchimie, 1998; Aquaman, 2001. Died: 1955, in Paris. Company Address: 33 rue François 1er Paris F-75008, France. Twenty-Five Years of Paris Elegance 1925-50, n.d.
Picken, Mary Brooks, and Dora Loues Miller, Dressmakers of France: The Who, How, and Why of the French Couture, New York, 1956. Garland, Madge, The Changing Face of Fashion, London, 1970. Kennett, Frances, Collector's Book of Twentieth Century Fashion, London, 1983. Mohrt, Françoise, Marcel Rochas: 30 ans d'élégance et de créations, 1925-1955, Paris, 1983. Robert, Guy, Les sens du parfum, Paris, 2000. Noel, Lucie, "Marcel Rochas Stresses Youth in New Styles," in the New York Herald Tribune, 3 August 1948. Alexander, Hilary, "The Face that Relaunched Rochas," in the Daily Telegraph (London), 16 November 1989. Weisman, Katherine, "Rochas' Tocade to Bow in September," in WWD, 6 May 1994. Weil, Jennifer, "Rochas' New Brew," in WWD, 19 June 1998. "Lavender Goes Green for Rochas," in Cosmetics International, 10 March 1999. Rein, Anne, "Rochas Sees the Light," in WWD, 28 April 2000. Loyer, Michele, "The Sleeping Beauties of Couture are Waking," in the International Herald Tribune, 11 October 2000. Jensen, Tanya, "Rochas: Classic & Refined,"in WWD, 8 October 2001. In the sometimes indeterminate world of fashion, Marcel Rochas was determined and decisive. He operated with a business acumen and cultural strategy (including the fashion designer as a conspicuous social mixer) that caused him in the postwar period to doubt the continued vitality and interest of couture—and to turn resolutely to his boutique operation and lucrative fragrance business. His motto was "Youth, Simplicity, and Personality," alternatively reported in the New York Herald Tribune (3 August 1948) as "elegance, simplicity, and youth," but it was in many ways the characteristic of personality that differentiated Rochas from other designers of his era. His initial fame came in the 1920s and rested on his tailleur, accompanied with full, supple skirts. In 1942, five years before the Dior New Look, Rochas had offered a new corset to create the guépiére, or wasp-waist, anticipating the return of the extreme femininity that enchanted him. Caroline Rennolds Milbank, writing in her book Couture: the Great Designers (New York, 1985), said Rochas and his skill were "characterized by a calculated originality." Originality was very important for Rochas, if only as a sign of rights and attribute of value rather than of real creative initiative. In the 1930s, he was already selling ready-to-wear and made-to-order clothes in his New York store. He claimed to have invented the word "slacks" in the early 1930s, along with originating the idea to include gray flannel slacks as part of a suit. In an era when women's trousers were limited to extreme informality or recreation, Rochas trousers were highly advanced if not revolutionary. His clothing was not cautious, and for him "original" and "invention" were key words in the vocabulary of selling fashion. The wide shoulders of the 1930s were created by several designers more or less simultaneously. He continuously played on the shoulders as a sign of the feminine—a fall-winter 1947 evening gown, for instance, invents broad shoulders through a capelet-like scarf attached to the bodice. Bolero jackets of the 1940s were lighter in construction than Balenciaga's inspirations direct from Spain; Rochas was more interested in the effect of the enhanced shoulders to pad and to frame. Likewise, a 1949 robe du soir dipped to a bouquet of silk camellias at the bust, but capped the shoulders and framed the face with a flaring lightness. In other instances, grand white collars performed the same role and in providing a sweet, portrait-like framing for the face. In January of 1948, Women's Wear Daily reported of Rochas, "this house is very modern but with the modernity which carries with it a tradition linking it with the fashion picture of the day. There is always an air of excitement in his collections which are designed to enhance the charm of women." If Rochas' anatomical obsession was the shoulder, his second favorite was the arm. He often embellished the sleeves in suits and coats, and his coats from the 1940s, which tended to be voluminous and drapey, were characterized by large sleeves. Loose blouson effects were more than carried over into the excess of sleeves as well as an interest in full backs. 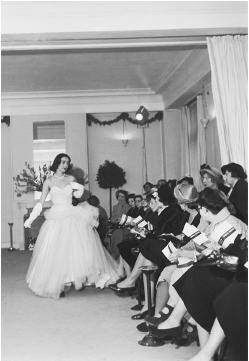 Picken and Miller, in their book, Dressmakers of France (New York, 1956), stated, "Conscious of the changes in fashion, Rochas was the first to give up his heavy burden of the haute couture collections and to restrict his activities to his boutique which specializes not only in accessories, but also in separates." Anticipating Cardin and the marketing orientation of fashion and beauty, Rochas was a visionary. Though his firm had quit creating fragrances during World War II, a separate company, Parfums Rochas S.A. was set up in 1945 to handle the burgeoning interest in perfumes. Upon his death in 1955, Marcel Rochas had not fully achieved the synthesis of design and marketing that would become the dynamic of late 20th-century fashion, but he had more than proven himself one of its pioneers. His business was taken over by family members who concentrated on developing fragrances. The Rochas name became synonymous with intriguing and evocative fragrances for women and men throughout the next several decades. The company was acquired by the Darmstadt, Germany-based Wella AG in 1987, and went back into couture with the hiring of designer Peter O'Brien 1990. Rochas couture remained overshadowed by its ever-increasing fragrance line until the market was flooded with signature scents. At the dawn of the 21st century, however, Rochas was once seeking recognition for its apparel as it prepared to show a spring/summer 2001 collection by O'Brien.